This lightly spiced apple and almond cake is a fabulous winter dessert. 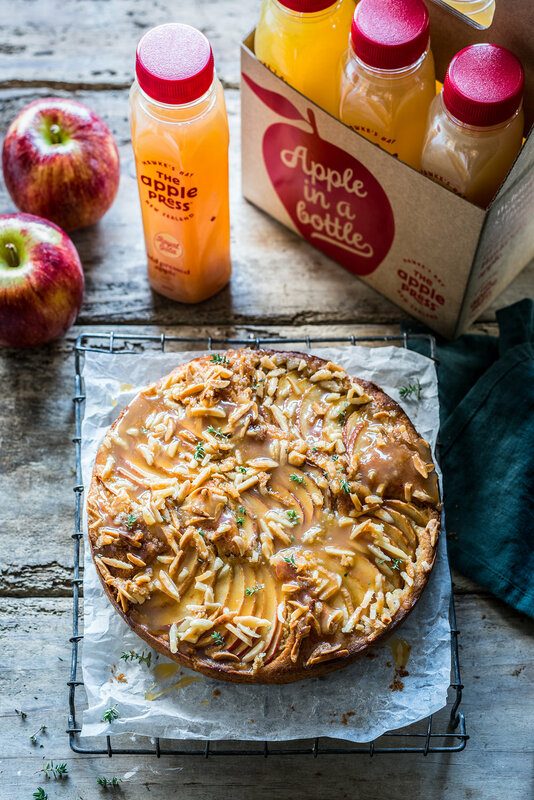 Drizzled with a generous helping of apple caramel and topped with fresh thyme leaves. Serve hot or cold with vanilla ice cream, yoghurt or whipped cream. I have partnered with the lovely folk at The Apple Press to come up with this delicious cake. I’ve used their Royal Gala Cold Pressed Juice however it would be great with their Jazz Apple or Braeburn Cold Pressed Juice’s too. Preheat the oven to 180°C. Grease and line a 20cm cake tin with baking paper. Cream the butter and caster sugar until light and fluffy. Add the eggs one at a time mixing in between. Add the ground almonds, flour and baking powder and mix until we combined. Spoon mixture into cake tin and level. Cut apples into thin slices and place on top of the batter, press them in slightly. Meanwhile, combine the sugar, melted butter and almonds for topping. Once the cake has been cooking for 25 minutes, remove from oven and spoon over almonds. Bake for a further 20 minutes or until golden and firm. Place the white sugar and apple juice in a saucepan over a medium heat and bring to a simmer. Once the liquid has become a deep amber colour, add the cream and gently stir through. Set aside to cool and thicken. 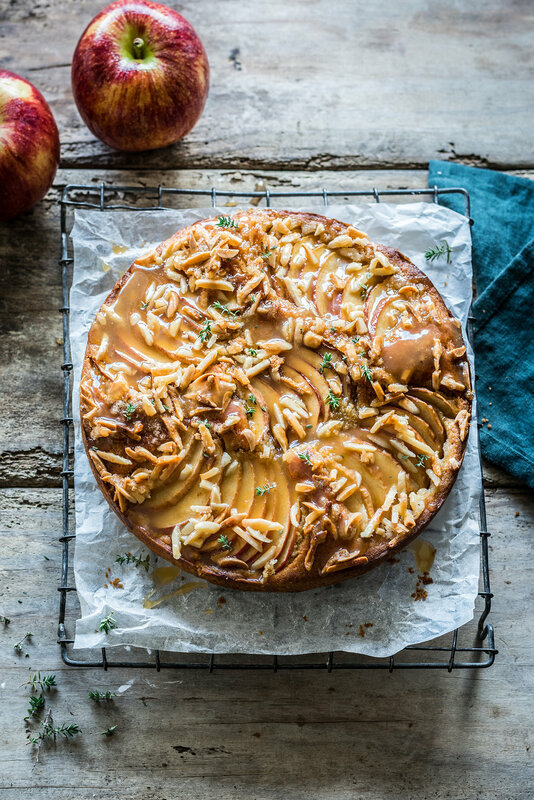 Pour half the apple caramel sauce over the cake along with some fresh thyme leaves. Serve with extra caramel sauce and ice cream, yoghurt or whipped cream.